A high school yearbook is a keepsake that is treasured for years to come, so choosing an eye-catching cover that reflects the attitudes of the class and the spirit of the school is an important task. In addition to creating a memory for students, high schools all over the country compete for awards for the best yearbook in their state. You are only limited by your imagination as to what you can cut out on the cover. You could even do a basic square or some circles of varying sizes. As you put together a yearbook with a cutout cover, keep in mind that the first page of your yearbook will show through the cutout. Plan accordingly with bright colors and your best photos. 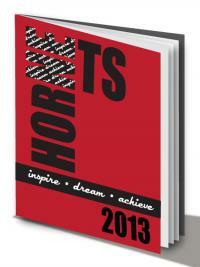 Even if the rest of your yearbook is black and white, try to invest a little extra and make the first page full color. Although your yearbook may be filled with posed photographs for each class in the school, adding some candid snapshots can show off the personality of your student body. One of the best ways to get a wide variety of candid photos is to allow students not on the yearbook staff and even parents to submit photos. As they come in, set aside those that are particularly striking for possible inclusion in the cover collage. In order to add text and have it show up, you'll need to add a band across the center of the book. Black works well for almost any school, but you can also use your school colors for the band and the text. If the color you choose for the band is dark, choose a light-colored text and if it is a light colored band then choose a dark colored text. The contrast between light and dark will make your yearbook title pop. 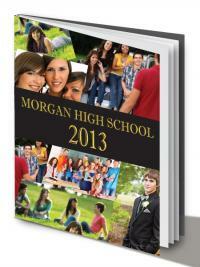 It works best to have the collage on the front, spine, and back cover of the yearbook. As you choose photos to build your collage cover, try to pick photos from different events throughout the year. Don't get stuck on one event, such as homecoming, for example. A good rule of thumb is to use one photo per event on the cover. Use a mix of different sizes and don't be afraid to overlap photos so that only student faces show in some of the selections. Only have room in the budget for a simple color cover and black and white text? No worries. 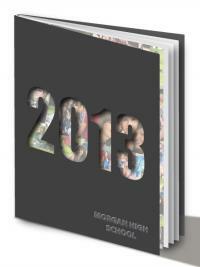 There are creative things you can do even with the simplest of high school yearbook covers. In this sample cover, the background color is a typical red that many schools use in their school colors. The name of the school's mascot is printed on the front, but instead of going from left to right and being all one size font, the designer has created interesting angles for the letters in the word "hornets." The first three letters are solid black but rest vertically in the middle left side of the page. The letters "N" and "E" are larger black letters, but the inside of the letters have been filled in with the words "inspire", "achieve" and "dream" written in script over and over to fill in the lettering. Finally, the letters "T" and "E" are printed horizontally and filled in with black. The ways you can arrange your text of choice are limitless. You could arrange the letters in an arc, diagonally across the cover or have some letters smaller and others larger. To keep things esthetically pleasing and not clutter the page too much, try to keep some of the letters with solid colors on the front of the word and the end of the word. Use the letters in the middle to add visual interest in some way. You could even cut out just those center letters to combine with the cutout cover idea above. 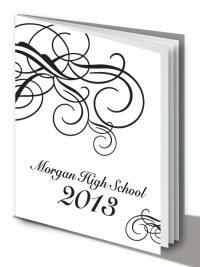 Perhaps your yearbook advisor just informed you the budget is so tight you can only have a black and white cover, or maybe you just want the elegant and simplistic look of a simpler offering. The design to the left offers a simple solution to creating an appealing black and white cover. 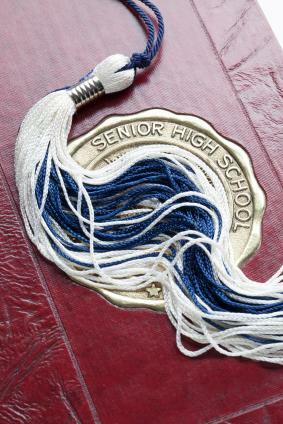 The name of the high school is in script, with the year in larger font. A script design is then added to the upper left corner and takes up about half of the top edge of the book. The design is repeated in thumbnail size in the lower left of the cover to create a sense of continuity. You can also take the design across the spine and back cover if your budget allows. There are many different artistic swirls that would work for this cover. If you don't like the simplicity of black and white but like the design elements, you could also add the swirls in a foil color that lines up with school colors. For example, let's say your school colors are red, black and white. Use the white background, black for the title and then add a red foil artistic swirl in place of the black one in the sample cover here. This cover offers an elegant design that students will appreciate each time they open the book in the future. 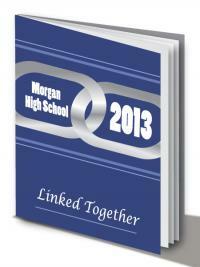 The theme of linked together is one that can be used throughout the yearbook. For the cover, use a solid color background and silver or gold chain links. Inside those links, you can place your title. The yearbook works best if you include the theme "linked together" written on the cover, so that the student understands the significance of having chain link images on the front. Although gold or silver chains work well, you can also use any color that matches your school colors. Prefer smaller links? Use them as a border for a solid band of color in which you write the title or as a chain image wrapped around the left top, spine, back and bottom right of the yearbook cover. To add to the theme even more, you could also use a four-color cover of students linked together with a rope chain or other lightweight chain. If you do choose to use a full color cover with photographs, you'll want a solid band of color for the title and to list the theme of the book, so that the lettering and the photographs don't fight one another for attention. You don't want a busy cover that is hard to read! Need More High School Yearbook Ideas? Sometimes the best yearbook cover ideas come from studying what other schools in your area have produced over the years. Yearbook teachers from other schools may be willing to loan your yearbook committee or staff a few samples. Use these samples to brainstorm with fellow students until you come up with a cover theme that you truly love.